4. 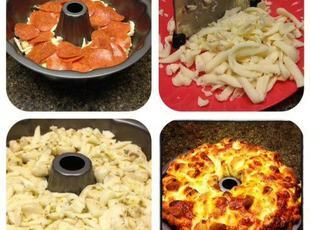 Layer dough pieces in bottom of bundt or fluted tube pan, next layer sliced pepperoni, shredded cheese and sprinkle with garlic powder. Repeat all three layers again in the same order, and then end with final layer of dough pieces.